Up at 5:30. Chris has to go. Bil and I take Chris and Barb out to Gauging Station. Extremely long day of packing; 9 miles for patrol, 12 for Bill and me. Barb and Chris are waiting (when we get to camp). Chris just bruised her arm. Dinner and sleep. More rain. Bill and I caught up with the patrol in the gulch just up from the drainage we had spent the night in. The hike back to the gauging station was at Christine's speed, trying to keep her comfortable. From the gauging station back, Bill and I went as fast as we could. Our total mileage for the day of 12 miles was the longest day, by far, we had had on the course. 12 miles is a long day anywhere, but over the terrain we were in and with backpacks recently filled at resupply, likely 60-70 pounds, it was pretty rugged. Having said that, I don't remember much about this day except feeling proud of myself for volunteering to help Chris. Up at 5:30. "Real" food for breakfast (eggs, home made banana bread, orange juice, real butter, bananas). Start today's hike. Rain and then fog. Christine falls and hurts her arm. We go on. Trail always starts from nowhere and ends in a swamp. We are soaked, cold and packs are heavy (from resupply). Can't see peaks to know where we're going. Christine's arm is swollen now and we stop and set up tarp. Fear of hypothermia. Make tea, eat a lot and tell a lot of jokes. Cathy finds us. She has two trustees with her. It looks like Christine is going to have to go out, but not tonight. We decide to camp here tonight. Barb and another trustee show up. We'll wait until tomorrow to decide about Chris. Sleep. This was a scary day. My memory, albeit romanticized, is that it had been raining for days and the "trail" was under a foot of water. Clearly we were all soaked through to the skin and Christine was in bad enough shape that we were very concerned. 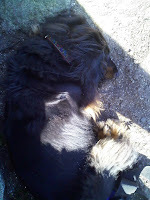 I recall that after we set up our tarps, we put her in her sleeping bag, but it took quite a bit to get her warm. The jokes were to take her mind off her situation a bit, and the food to stave off the hypothermia. Still, I am fairly certain that she had the beginning stages of hypothermia and was possibly in shock from the injury. She did come around a bit later in the day and we were able to keep her safe. As I read ahead to see what to map, and these are all guesses at routes, though I do generally have beginning and an end, I am finding that my memories are in many cases very wrong in relation to my journal. This memory seems to be fairly accurate. I wish I could find the people in was on the course with, to read there journals and talk about their memories. I don't think that is possible though. Perhaps I will make an attempt though. Group is supposed to be up for eight o'clock. We 4 (Bill, Tony, Steve and me) get up early and wash our hair for the first time on the course, feels great. Do some more serious rock climbing. I try to climb 3 (route not grade), fall and lose my confidence. Try 4 and don't make it. Go up on top and belay a little. The Barb (course director and one time top woman climber in the States) suggests I try 1. I do and eventually make it. (This is where the rubber meets the road! When I fell on climbing 3, I had not listened and was 10 or 15 feet off the route and pendulumed across the face pretty good. I was done. Even 15 feet off the ground I was shaking and frozen with my heart pounding and sweating palms. So, to conquer route 1, and I was pushed hard to do this, huge. Confidence came rushing back.) Belay again. Go down to try 4 again. Make it this time. Barb now climbs 2 (hardest climb) and gets a knee jammed in the off width in the process of making it. Rates it a 5.8 or 5.9. Back to resupply. Have to use a gurney to carry food (yes, it;s that heavy). Split up food and learn fixed line techniques, both vertical and horizontal. Have torts for dinner again. Rain. Sleep! My dad had allowed me to quit things that got uncomfortable all my life. I am not saying that as a criticism; I expect it was, in large part, to compensate for the discomfort in my life, dealing with my mother's illness. Regardless, it had been my MO. I had quit ski racing, Boy Scouts (twice), baseball, Y camp; just to name a few. In retrospect there were also many things I never tried due to a lack of confidence. I missed out on a lot of things I wish I hadn't. I probably would have quit Outward Bound if I wasn't 2,000 miles from home and in the wilderness. Being pushed up that rock face was the beginning of a change in me. It wasn't a dramatic all at once change, but there was a beginning of an "I can" mentality that was completely new to me. I don't believe I did anymore climbing during the course; there were one or two climbing finals; I did natural history. However, I had gained enough confidence that when I got home, and was asked by kids in the neighborhood about what I did on Outward Bound, that I climbed up the side of a house to the roof to show them. Up at 5:30. Headed toward Lily Pad Lake for resupply on day 6; 7 miles so we figured we'd go 5 today and 2 tomorrow. I lead. Up one peak. On the way down the other side saw 1 big mule tail deer and a smaller one, both in velvet. Down about 1,500 feet from Easy Pass to a small lake with no name. Cathy is waiting for us. We decide to go on to Lily Pad. Bill was leading and got us lost. Map work and we were there. Had another great meal. I think we are getting the hang of it. Bill, Tony and I (oh yeah and Steve also) sleep under the same tarp. Sleep. I remember this day completely differently. You will see by the map that I recall going completely the wrong way. I am pretty sure we didn't get into the right gulch until about 5pm, and hiked well into the dark. We had two flashlights, one at the lead and one at the sweep. I recall this was one of the those nights where you couldn't see your hand in front of your face. I don't know who had the watch, but I am pretty sure we climbed until 11pm when we arrived in the saddle of the pass. That is where we spent the night. It was very windy; so windy in fact that Christine's ground cloth blew away in the night. Cathy had gone ahead to Lily Pad Lake; from my journal she must have been expecting us. I wonder if she was worried about us. This is what I remember. I can't explain why I didn't put it in my journal. I thought maybe, this happened later in the trip, but there is no reference to it. Another of Lucy the Hiking Wiener's trip reports. This one is from September 2009. We headed west out Route 26. This would give us greatest number of choices, I guess. First stop was at Chuck's new favorite store True North Adventurewear to pick up some trail food. Chuck is a big fan of Power Bar Gel Blasts, which are sold here. Chuck must have spoken with the guy that owns the place, because when he came out, he had decided to go the the Success Pond Road side of the Mahoosucs and do Goose Eye. Chuck did something fun- and possibly illegal; as soon as we turned onto Success Pond Road he pulled over and let Ryan drive. My boy did great! The trail head was quite a ways in, we entered New Hampshire with the Mahoosucs on our left. We passed trail heads for the Speck Pond trail and the trail to Mahoosuc Notch (the toughest mile of the entire Appalachian Trail). And, then, we were at the trailhead. The beginning of the trail was a very pleasant walk in the woods. The weather was perfect! The grasses alongside the trail were pretty long and made kind of a tunnel for me. It was really neat. Chuck and Ryan laughed about the fact that they couldn't see me as I hiked along the trail. I was really enjoying this; my left front paw didn't bother me at all! After a bit, the trail began to climb. Ryan was going pretty slow which resulted in Chuck going pretty fast; huffing and puffing along the way. Dad's legs are much shorter than Ryan's. Anyway, the trial climbed gradually like this for maybe a mile, and then got very steep. Here we hiked slow and steady, and kept going up. We were on rocks quite a bit, and I had to scramble a bunch, but I was doing fine. And, really having fun. Suddenly, we entered a very strange and mysterious section of the trail. It leveled out a bit and everything was covered with thick green covering Chuck called moss. It was everywhere, except on the trail. Chuck pushed his finger into it and it disappeared- it was really thick. This place was almost spooky. The trees started getting very thick and closed in on the trail and the wind was howling through the tree tops. The temperature dropped down into the low sixties, according to what I heard Chuck say to Ryan. And everything was green! Very strange. Chuck needed to take a shoe off and settle down behind a rock to block the wind. I laid down at his feet and instantly went to sleep. I guess the hike was more tiring than I thought. I think I heard Chuck tell Ryan that I was snoring, but I could have been dreaming. We rested about 15 minutes and headed down. The trip down was pretty quiet. Ryan was whistling and singing; and texting. It is probably not a very good idea to text and hike; teenagers! I was pretty pooped, so I didn't do my normal downhill dashes off the sides of the trail, I just stayed with Chuck and Ryan. It took just over two hours to get back to the car, bringing our total hike time to almost exactly 5 hours. As soon as we were there, I got into the back seat and went to sleep. It was a super day! When we got home, we all went over to the Henry's, our neighbors. They were showing movies on the side of their house. We watched Muppets in Space and Back to the Future. Chuck had made a sleeping bag into a blanket. I was tired from the day, so I got into the sleeping bag and curled up around his feet and went to sleep. What a great day! Coordinator for the day. Up at 7:00 to wake everybody up. Had breakfast. Went bouldering and then learned a few knots and belaying techniques. On to East Pass above Timberline Lake. First day packing without Cathy (instructor). Made excellent time. Met Cathy at Easy Pass, set up camp and went to do a little rock climbing. I like to belay. Christine let me take a few pictures with her Yashica FX-2, I fell in love with it. Back to camp to dig latrine and have best meal so far on course. Went to bed. Sky was more filled with stars that Katahdin Iron Works. Tony and I saw lots of shooting stars and satellites. Got into a weird conversation. Sleep. I never really got comfortable with rock climbing. I had done a bit with my Dad when I was younger, but even at 16 the fearlessness of childhood was deserting me. Again, my memories don't match the map. Reading the words in my journal, I can see in my mind's eye things from this day. The contour lines on the map don't really match those images. The terrain we were in was the most beautiful I had ever seen. Here in the East, with little exception, you hike on a trail, in the woods, with danger lurking above timberline when you find it. Here, we had been above timberline since leaving Little Sopris Lake. Being coordinator for the day, especially on the day when we are alone for the majority of the day, sounds very impressive. I am not sure that I was responsible for anything but waking the patrol and digging the latrine. I am have also done the dishes. Sounds impressive though! Lucy the Hiking Wiener wrote this post a while ago. This is one of my favorite hikes as well! He had some work around the house to do in the morning, so it was 11:30 before we got off. 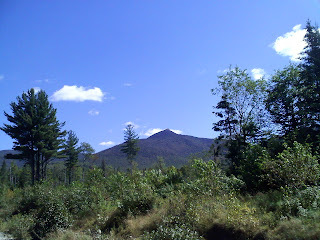 We were headed for the back of Caribou Mountain in the White Mountain National Forest. After an hour in the car, we were confronted by a tree across the road at a place call Pooh Corner Farm. Chuck went in to ask if we could park there while I waited in the car. When he came back he started getting ready, while I stretched my legs and checked out the scents. There were some pretty strange noises going on, so I went to investigate. It didn't take long for me to find it; it looked like a small horse (which I know about because the first place I lived with my brother had horses), but had really long ears. Hee haw! Chuck said his name was Eyeore. I let Eyeore know, in no uncertain terms, that he freaked me out a bit. I wish Chuck had taken a picture, but he didn't. The first 3/10 of a mile was on the road to the trailhead. The woods remind me of fall; a carpet of brown and no leaves on the trees. The sound of rushing water was all around us. There weren't any interesting smells, so we just hiked. The hike was pretty uneventful. Chuck did have to help me across two "streams" rushing with snow melt. Boy, he's out of shape; he huffed and puffed and sweat just poured off him. We ran into a couple coming down who probably thought Chuck was having a heart attack right there on the trail. As we continued on, the going began to get tougher. Often we were in mud up to my belly, and I had a really hard time. We began to encounter snow on the trail, too. 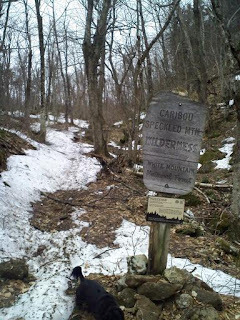 When we hit the border of the Caribou Speckled National Wilderness (that's me near the sign post in the picture), the snow started to cover the trail completely. I was having trouble going on, so Chuck turned around. The hike out was great, I went ahead of Chuck, waiting only when I was about to go out go sight. It was fun. At one point, I found some great smells and took a short side trip, but as soon as Chuck whistled, I was back on the trail. I made quite a mess of the car on the way home. Chuck gave me a bath (yuck, I hate baths) when we got there. I'm still pulling sticks out of my hair. Sometimes I wish I was a short-hair like Fenway and Chauncey across the street. Even though we didn't get to the summit, it was a fun day. I'm sure we'll be back this summer to do it again. Up at 5:30 again. Went up above lake and worked on snow techniques; self arrest 4 ways and glissading. Lot of fun. Then we hiked up to the snow cornice and over it with a belay rope. Colleen turns out to have a phobia of falling. We ate lunch at the top of the pass where the cornice was, and then peaked the left mountain to do some map work. 3-1/2 hours on boulders the 2-1/2 hours on grassy knolls to Mormon Lake. Coordinator for the next day. Some people went skinny dipping. Sleep. The peak that we climbed took us to around 12,400 feet. It seems impossible, but I don't recall feeling any ill effects from the altitude or the 60 pound pack I was carrying. I guess that is what a 16 year old body is capable of. We were using external frame backpacks and rectangular sleeping bags. All we carried for shelter was one-man tarps; I don't recall what our ground cloths were made from; some kind of plastic, I guess. For clothing, we wore wool pants, wool socks with silk sock liners, cotton undershirts, wool sweaters and yellow rain slickers. We wore gaiters in the snow and rain. I wore a pair of leather backpacking boots, that though I still have today, I don't wear anymore. Wool and silk were the technical fabrics of the day, silk to move the moisture off the body into the wool, which continues to insulate when wet. Up at five:thirty... jogging that distance of four miles is difficult but I make it. At aqueduct we pick up packs and do some map work. Hike (bushwack) to Little Sopris Lake, which is at about 11,400 ft. Slept under the stars. Learned alot about first aid and mountain rescue. Tony, Bill and I become fast friends and slept in the same a place. Area around Sopris Lake is beautiful. Sleep. Until I started this, I had never really had an idea of where we were in Colorado or where we went from day to day. It is very interesting to me to be able to now see this on a map. Unfortunately, the photos I took are on the textured paper that prevents fingerprints, making them impossible to scan. I no longer have the negatives. At Little Sopris Lake, I began to relax a little from the culture shock. That combined with the openness around Little Sopris Lake made a very strong impression on me. It was so beautiful; so peaceful. Leave from Y at about 8:30. 3-1/2 hour bus ride to Gold Park Campground. 1-1/2 mile jog to trail head. Air is pretty thin whereas this trail head is at about 9,000 ft. At trail head we are broken down into patrols or 8 or 9. I am in a group with 8, later on this evening 9th person arrives, having missed the bus. After we are split up, my patrol (Bill, Tony, Dave, Steve, Emily, Christine, Colleen and I) learn how to cross a stream (this was not exactly a stream, and the water was moving very fast) and man this is the coldest water I have ever been in. Now we check equipment out, and take care of personal items. It starts to rain and we eat lunch under tarps we have just set up. After lunch a course meeting. During lunch Christine is cutting cheese and makes a very deep cut between her thumb and index finger. She has to go into Leadville for stitches. No antiperspirant is allowed. (How is that for stream of consciousness writing?) We eat tortillas for dinner and Will (9th student) arrives. Patrol meeting now. Then bed because we have to get up at 5:30 and run 4 miles to an aqueduct. Here we pick up our packs which weigh about 50 or 60 pounds. Sleep. I find it very interesting how, 33 years later, the strongest memories I have are of things I just gloss over in this journal entry. I was 16-1/2 years old. I am sure that from my father's perspective, I had been a challenging teen. My parent's had divorced when I was 12 and my father remarried shortly thereafter to a woman who was closer to my age than his. I dealt with this badly. Up until he remarried, my dad and I were a team. My mother had struggled with alcohol and prescription drugs, and it was up to Dad and me to help her with that, and keep it all secret. When my step mom came into the picture, we weren't that team anymore. That didn't sit well with me. The Colorado Outward Bound School had been featured in a documentary that Dad and I had watched. I don't know why, by it looked fantastic. I saw the challenge and the wilderness. My father likely saw the troubled teen therapeutic value. I had the money in the bank to go, and was enrolled. I think at the time, I felt like my dad had called my bluff; 23 days in the wilderness of Colorado, yikes! What had I done? My dad, step mom and sister drove out to Colorado. I will never forget the feeling I had when I first saw the Rockies off in the distance. It was an amazing mixture of wonder, excitement and terror. That view was truly awe-inspiring. At 5 am on the morning of September 8, 1979, my dad and I left where we were staying to drive the hour into downtown Denver and the YMCA. When we got there, we unloaded my stuff onto the sidewalk and Dad said goodbye, got back into the car and drove off. I was alone, far from home, in a big city. I was terrified! During the next two and a half hours, more and more people arrived, and at 8:30 we boarded a bus and started heading for base camp. We followed Interstate 70 West to just the other side of Vail, where we took US Route 24 South to Homestake Rd and on to Gold Park Campground. On the way into the Campground the bus was "stormed" by the instructors and staff of the course and we were told in drill instructor style to get off the bus. Others were unloading the bus and throwing our luggage into a big pile. This was followed by being told, again drill instructor style, to get our running clothes on and pack our street clothes. When this was accomplished, they threw all of our bags into a waiting pickup truck and they all drove off, telling us to run after them. Now, I should point out that this was at roughly 9,000 feet above sea level. I had spent the summer living at my mother's, at sea level, smoking a couple packs of cigarettes a day, and where I didn't train like the school suggested. Needless to say, as soon as I started running, my lungs began screaming at me, telling me what an idiot I was! The pickup trucks, with all the instructors and our stuff disappeared, leaving us to hope we were following correctly. Thankfully, after about a mile and a half, we found them. The time was about 12:30 pm and I was so far out of my comfort zone that I couldn't remember it. This is how the one of the most formative experience of my life began. I had no way of knowing what was to follow during the next 23 days or the levels of my body and mind that were going to be effected by it. I wrote a journal during that trip and took a few photos. It is my intention to share those as well as the other romanticized memories I have. I will also try to map the trip, if only for reference. I hope you enjoy reading it. This summer, I have found the bugs in the woods to be much worse than I can remember them ever being. I truly dislike using bug spray, especially the ones that work; the ones with a high percentage of DEET. In the past, I have simply hiked with the attitude that bugs don't bother me, and they wouldn't. I know that sounds weird, but it worked for me. This year, the mosquitos especially, have enjoyed a good laugh over my positive thinking bug deterrent. There have been times when I felt like a Gulliver with the bugs as Lilliputians dive bombing my head in Sopwith Camels. And I swear I could hear them laughing at me. So I started wearing bug dope. I have used several Off! products over the course of the summer. Here is a review of each one I tried. The first one I tried was Off Smooth and Dry. This is an aerosol, making it impractical for extended backwoods travel, though it is fine for day hikes. This spray is almost a powder. Though this is 15% DEET, there was no DEET burn at all, except when I sprayed my hands and rubbed it on my sweaty face. It was very effective against the bugs. I did have to reapply it over the hike as sweat diluted it, but that is the case with all bug repellents. The only downside to this product is that it stains clothes white, though the stains come out in the wash and I have the attitude that if I am not dirty on a hike, I am doing something wrong. I found this product to be effective against mosquitos, deer flies and ticks. The next product I used was Off Active. This non-aerosol spray contains 25% DEET and claims to be sweat resistant. I did not have to reapply this product over the hike, so as far as I am concerned this product is sweat resistant. However, there was a pretty good burn with this spray, especially on my face, but I could feel it on my arms as well. On the plus side, it was effective at keeping the bugs away. Next up was Off Botanicals. This product was in the form of a moist towelette. It is a "plant-based" repellant and contains no DEET. I was walking through tall grass the day I tried this repellent, and put in on after I had started. Before I put it on, I had removed three ticks that had bit me enough so that two of the spots bled when I removed them. I rubbed the towelette right over those spots when I applied it. There was no burn of any kind. Though the packaging appears to suggest that it is a mosquito repellent, as opposed to a bug repellent, I found it to be effective against ticks and deer flies as well. I might consider this product, but I am not a fan of the moist towelette application method. Finally, I tried Deep Woods Off. This pump spray repellent contains 25% DEET like the Off Active. I am not really sure why, but I felt no burn with this product, even on my face. I have had this bottle for a while so I thought maybe it had expired, but I can't find any thing on the packaging to suggest it ever expires. This product was effective against the spectrum of bugs in the Maine woods, I was not bothered, though I did have to reapply it over the course of my hike. I still don't like bug spray, and would prefer not to wear it. I carry a small bottle of Ben's 100 in my backpack that I may have had since I was no Outward Bound in the seventies. That will stay there. My day pack, however, has had the Off Active in it. That will be replaced with the Deep Woods Off, because in spite of needing to be reapplied, it provided both comfort and effectiveness. For the past few years, I have read, with great interest, the trail journal of an AT thru-hiker (someone who hikes the trail from Georgia to Maine (northbounder) or the reverse (southbounder) in one hike). Last year I read the journal of "Portrait"; most long distance hikers adopt trail names. Portrait on Katahdin at sunrise- the end of his journey. Portrait is one of the most poignant writers I have read. He is obviously very intelligent and his writing reflects that. He comes from a family of thru-hikers- he mentioned both his brother and his sister had done the AT in previous years. He also is a pretty good photographer, taking one my favorite hiking photos ever. This year, I read Dos' trail journal. Dos has been a great read as well, but for different reasons. She is older, and has done the hike carrying some baggage; she is suffering from PSTD, which has reared its ugly head a couple of times during the hike. Dos just finished the hike a couple of days ago, so, "Congrats, Dos!" I like to think I have what it takes (physically and mentally) to do a thru-hike, but who knows? Patience. 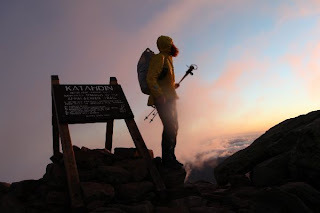 An AT thru-hike takes an unsupported average hiker between five and six months. You walk until you are done, eat, go to bed, wake at dawn or thereabouts, and do it again. Patience. I don't think there is any way to really train for a thru-hike. Sure you can be fit, but there is a difference between training and thru-hiking. My plan for a thru-hike would include a good long period of building up the mileage; going too far, too fast seems like a great way to fail at a thru-hike. Acceptance. You gotta be willing to accept the world outside of your head. You are gonna be real dirty- accept it; you may be in a shelter with someone you don't like- you can't change that. Some nights sleep is going to be elusive- so what, for tomorrow you walk. Joy. The trail will present incredible opportunities. There will be physical beauty, there will be human kindness and selflessness. There will be a good showing of Nature's awesomeness. There will be solitude and great camaraderie, sometimes at the same time. Mental fortitude. You hike and then hike some more; even when it is the last thing you want to do. You are gonna hike through rain and possibly snow. You are gonna get cold and wet. You may have to hike at night. You are going to have aches and pains, but you are going to have to hike through them. Flexibility. One of the most alluring things about a thru-hike to me, is the way that thru-hikers develop the ability to go with the flow. If the day is hot enough to be dangerous for hiking, they hang out in the shade of a culvert during the day and hike in the cool of the night instead. Selfishness. At the end of the day, you have to hike your own hike. You will hook up with other hikers and hike as a group, perhaps for weeks on end. But, the time comes when your paths separate- they want to go into town and you want to hike on- and you leave the group to go about your hike. I am certain that for most people, the thought of hiking for six months non-stop sounds crazy. I am equally sure that for many people who start the hike, the romance of the trail quickly dims, and they leave the trail (a very small percentage of people who start, finish). For me, the grittiness of the trail draws me; the physical and mental test. At the moment, life's responsibilities prevent me from going, but eventually, I hope to create a way to go test myself on the trail. 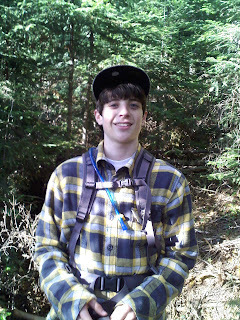 Back in 2008, I headed back out into the woods. When I was much younger, I had hiked a bit with my dad; I recall two attempts up Big George, one successful (the other in a wild thunderstorm above timberline), two or three climbs up Tumbledown in Maine, Mt. Blue in Maine and Cadillac on Mount Desert Island. I know there were other hikes, those are just the ones I remember. When I was 16, he managed to send me out to Colorado, for Outward Bound. I had seen a documentary on Outward Bound and thought it looked awesome (from afar) and Dad found a way to send me (as much to live vicariously through my adventures as anything). I don't recall much hiking with Dad (or anybody) after Outward Bound. He bought me a Kelty external frame backpack for high school graduation and an EMS 15 degree bag at some point, but neither saw any use backpacking. Then came life; running the family business, marriage, a couple kids, a house, a dog... Though I never forgot how much I loved being in the woods, I didn't get into the mountains. We did manage a few very small hikes with the family, but that was it. (I actually broke my leg on one of those hikes. This might be a good post at some point.) There were also a couple of amazing mountain pond fly fishing hikes with the guys, one to Speck Pond and one to Horns Pond on Bigelow. I was sore for a week after each of them; but those were incredible hikes. I got fat; and very out of shape. At some point, maybe 2006, we climbed Sugarloaf with friends. We went up the back side (an actual hiking trail) and down the ski trails. Everyone hiked faster than I did, but as miserable as I was, I was determined, and never stopped. By the time we got to the top, I was soaked (wearing cotton), and mean. I was so tired and angry with myself for letting myself go so badly, I was just plain mean. The next year, I started hiking (walking in the woods, really); very slowly. That was 2008. I was 50 pounds heavier than I should have been, sedentary and suffering from the effects of fast food for at least one meal a day, five days a week. That first "hike" was at a couple of trails built by Trails LA in Lewiston, Maine. Walking on urban trails made me angry. So I drove to Fryeburg and hiked up to Lord Hill mine. The weather was fairly warm and humid; and very still- there was a "hurricane" coming up the east coast. I remember that there wasn't a sound in the woods; not a bird, not a bug- they were all apparently hunkered down. At the mine I sliced my finger with a rock. It bled pretty bad. I had nothing in my pack to fix it, so I wrapped a bandanna around it and made a mental note to put a small first aid kit in my pack. I had realized how awesome it was to hike alone; but at this point, I was woefully unprepared, even for a hike as small as Lord Hill. I joined the gym, with the plan of first getting into better cardio shape. That lasted 2 trips to the gym. I just can't see riding a stationary bike, walking on a treadmill or climbing on a stair climber, when I can just go to the woods. I stopped going, but continued to pay for the membership (this is very out of character for me; the continued to pay thing, I hate wasting money). The problem was, I couldn't walk my way out of the foot and lower leg issues. The more I tried to walk the worse they became, and recovery wasn't a day or two, it was a week or two, undoing every gain I had made. I was stuck! Then, on a whim, I went vegan. (I am not here to sell veganism, but it worked for me.) I had heard enough accounts of people who had experienced fantastic results, that I had to try it. Honestly, I was shocked. In the first two weeks, I lost 17 pounds and I felt amazing. Then over a short period of time, I lost another 8 pounds. The foot and leg problems started to subside. Many days I walked 2 miles at lunch and did 5 miles on the weekend. I began to contemplate running again - I had not run for 23 years. My doctor suggested running intervals in the woods- only run the uphills, because it is easier on the body. When I tried running on the road I found that my core was nowhere strong enough and the lower leg problems returned. I found though, to my delight, that I could run on a treadmill without much problem. My cardio began to improve. I went up Mt Zircon with my elder son. To my utter amazement, I was able to average 2.5 miles per hour up. My pace actually caused him to sweat through his shirt, something he has never done while hiking with me. I felt great, and had no pain in the following days. So here we are. I am back at the gym, this time lifting. My weight loss has leveled for the moment (it has been a while actually), but I am more determined than ever. I did a ten mile hike in four hours last Saturday and am planning another tomorrow. I feel better than I have in years, and am really looking forward to some great adventures to come. I am even daydreaming about doing the AT. This is not a recipe for success I am offering to others. I read a bunch on those with great interest an did nothing. In the end, I had to discover my own internal motivation. It took years! First, getting back into the woods and wanting to be there more often, for longer periods, more comfortably. I had toyed with the idea of becoming a vegan for a couple of years, so it was in the back of my mind. And, I found that it worked for me, and really has provided the impetus for the rest of my gains. Back in the winter my doctor was recommending high blood pressure medication; when I saw him early this summer he commented, "I can't say your blood pressure is good, because it's excellent!" I am still about 35 pounds heavier than I want to be, so this is a work in progress. But I have a plan; a plan that includes being in the mountains. That is where you'll find me. If you see me, say "Hi". If you are struggling with healthy weight issues, my message is this, "Don't lose faith!" Stop caring about what other people did to be successful (me included); find find that thing that you can be passionate about and use it to create your internal motivation. Every personality approaches things differently, so what I do is likely not going to work for others as well. Cut yourself some slack and commit yourself to finding the motivation to works for you. You're Gonna Get Wet - Deal With It! Okay, let's face it, if you spend anytime hiking, you are going to get wet. Whether it is a warm day and you are perspiring (I sweat, but some of you might prefer that term) or it's raining or both, being wet is a given. Now that we have accepted that reality, let's talk about how to deal with it. First and foremost, remember this: "Cotton kills!" It is also uncomfortable when it gets wet. When I hike, I generally have only two pieces of cotton in my attire: a handkerchief as a sweatband and maybe underwear, if I am just out for the day. Cotton, which is comfortable when dry, causes problems out in the mountains because it holds moisture against your skin. There is some real science here (a great article by one of my favorite hiking bloggers on the subject), but the thing to remember is that wet cotton 1) doesn't dry fast enough and 2) doesn't insulate; in fact, because it holds the moisture and doesn't insulate, it has a negative insulating factor. In the case of the handkerchief, I want the negative insulating factor; it is one way I deal with overheating, but it is the only place I will wear cotton (save the undies, sometimes). So, obviously, you will need a shirt that isn't cotton. Your core is the most critical important part of your body for well being, and the shirt you put against it is an important choice. In the summer months, you want a shirt that will pull the moisture away from your skin, will provide insulation when wet and will dry quickly. There are many shirts out there that will do this. My favorite, though is the UnderArmour Loose T-Shirt. I haven't tried the EMS Techwick or the offerings from any of the other outdoor retalers, and they may be just as good, but I haven't tried them, so I can't recommend them. Last year, I had family up from California. While they hike, they had never worn technical fabric. I took them to Cabellas before we headed up to Katahdin. The day we hiked was very hot with extreme humidity. As we approached Katahdin Stream Campground on the way down, both my sister and her husband commented on how amazing those Under Armour shirts were- they had never been so comfortable hiking. It really does make a difference. You also want your pants to dry quickly. In the summer, I wear shots (although I am seriously considering buying a pair RailRiders Eco Mesh Pants). I currently rotate a pair of Columbia Cargo Shorts and a pair of North Face Shorts. Both are made from synthetic fabrics that dry extremely fast. This is very important because when it rains, the bottom of my shorts legs get wet (I don't wear rain pants and all the water from my rain coat ends up on my pants). It also allows me to go swimming without concern if the opportunity presents itself. Socks are another important area- mostly for comfort in the summer, more for well being in the shoulder seasons and the winter. I wear Smartwool or some other Merino wool blend in the summer. Though my hiking shoes are waterproof, I still want to prepare for wet feet. (Truth be told, I would prefer that my hikers were not waterproof- poor decision on my part.) I thoroughly enjoy walking through that nice cold stream that generally runs beside the trail at some point on the way down, (with my shoes on) but want my feet to be comfortable when I get out. Wool is the natural technical fabric- it insulates just as well when wet as it does when dry. So there you have it. In addition to maintaining warmth, technical fabrics are significantly more comfortable when you are wet. If you are at all like me, being comfortable makes hiking much more enjoyable. As recently as a year ago I considered myself to be conservative. In fact, I used to think of myself as just slightly to the right of Genghis Khan. When it came to government intrusion of any kind, I was libertarian; nay, perhaps anarchist (in the pure sense of the word). Over the last year, I have learned to embrace my inner hippie though. Interestingly, and I should probably point out that I don't consider political inclination to be a lateral scale, but a circular continuum, I find myself rapidly becoming egalitarian. This may just be in preparation for the zombie apocalypse, though. Either way, I thought I would just throw out some observations of the world, with no particular theme or order. Why do I always run into people dressed in walking shoes carrying a 12 ounce water when I am hiking back to the car late in the day. I hope they don't plan on going very far. Yikes. Speaking of yikes, I once ran into a group of two "men", one woman and two kids hiking. One of the kids was holding the woman's hand, the other was on one of the men's shoulders; he was drinking a beer as he hiked; the other man was drinking a beer that we still in the six pack rings with four other full beers and smoking a cigarette. There was no water to be seen and nobody had a pack of any kind. Hmmm, can you say recipe for disaster? Completely off topic, but don't you wish government regulations didn't dictate dumb stuff? I love the braille instructions on drive up ATMs that are clearly marked, "No walk-ups allowed.". I can only assume that is required be some part of the ADA. I have been very impressed with the waterproofing on this shoe. I have yet to have any kind of water enter the shoe through the membrane. I also find the breathability to be second to none. This is one of the shoe's best features - you can wear them day after day and the don't get funky. The only issue I have with the show is the traction. Wearing them at work, I have to be extremely careful walking across a newly mopped floor or wet concrete. And though I wear them all time on walks through the woods, I am very uncomfortable climbing mountains with them. In fact, the first time I wore them hiking, I climbed Streaked Mountain in Buckfield, Maine at the tail end of a rain shower. Streaked is sheet rock from about half wayThough I got to the top okay, as I was shooting video with my phone at the summit, I slipped on the rock and smashed my phone on the ground. Coming down was extremely dicey, with my feet slipping out from under me a couple of times. If you are looking for around town shoes and money isn't the issue it is to me, these are great shoes. Personally, I am going back to my worn out LL Bean $59 hikers. Mount Zircon, in the western foothills of Maine, has an elevation of 2,250 ft. The summit is mostly treeless and provides wonderful views in all directions; the Presidential and Mahoosuc Mountains to the west, the Bigelow area to the north, the Androscoggin River valley to the east and the Sumner/Buckfield area to the south. The trail goes through an area with an interesting history, both human and natural. Mount Zircon is home to the Moon Tide Spring; a spring so named due to the cyclical fluctuations in its flow. According to the summary of The Mount Zircon Moon Tide Spring An Illustrated History by Randall H. Bennett, the spring opened to the public in the 1850's. At some point it was purchased by the Ricker family; founders of the Poland Spring Hotel. Eventually, there was a 50 room hotel built on the site. All that remains, at least on the trail, is the spring house, which is behind a chain link fence, and some very polite No Trespassing signs (I am not being sarcastic; they say "Please") under the Poland Spring Water Company logo. I found the trail head somewhat difficult to find. This is likely due to the fact that I didn't fully read the directions to it on Maine Trail Finder. Interestingly, I pulled into what I thought was the trail head only to find a sign stating that "This is not the Mount Zircon trail", but with no further instructions. Once I stopped and read the directions again, I found it without trouble. The trail description says that the trail follows a dirt road for two miles. That is exactly what it does. There is no approach; it starts from the gate at a steady grade and in an almost straight line for 2.2 miles before leaving the road to the left. When we (my son Ryan and I) were there, there was active logging going on in the area, though they were not present while we were there. As we hiked the road, we came to a fork with the right side of the fork likely going to the Mount Zircon Reservoir. It was obvious that we should take the left, in spite of absolutely no trail markings of any kind, because the right side had the polite trespassing signs on it. We knew the trail would leave the road to the left and we were looking for it. Eventually we encountered a trail off to the left that had many snowmobile and ATV trail markings on it. We contemplated this trail and decided it wasn't where we wanted to go. I consulted the Backpacker GPS trails app on my phone and it made sense to continue up the road. When we did find the trail to the summit, the start of it was clearly marked; though the trail had no markings until the summit where it is marked with trail tape. From where the trail left the road, it continued in a straight line, at a constant grade (steeper than the road) until we reached the summit cap itself. At one point, it follows what looks like a waterfall, and though there was no water present when we were there, the rocks were covered with moss. Unlike the road, which runs through a mostly deciduous forest, the trail to the summit goes through a wonderful fir and spruce coniferous forest, providing a beautiful resinous smell on the humid day we were there. As soon as we reached the summit, we encountered the benchmark. We wandered around in the clearing for a few moments, taking in the sights, before realizing that the fire tower that is supposed to be there was nowhere in sight. This led to looking for the trail to continue and we found that the trail continued a bit further, where we found the true summit with a cairn and a rusting fire tower, lying on its side. We could see rain off to the west, though a quick check of the MyCast weather app on my phone revealed none near us, the weather seemed favorable for a thunderstorm. We quickly made the decision to move off the summit, in great part due to the moss covered sheet rock on trail. We were prepared for rain, but I wanted to be off that part of the trail before it got wet. In the end, it did not rain; we did feel a couple rain drops though it was probably virga that reached the ground. My three least favorite types of hiking are, in order of dislike, road, clear-cut and straight line constant grade. This trail offers two of the three. While the summit was nice, I guess I am more of a journey than destination guy, and I found this hike to be boring. I decided to try Goose Eye (map) again. This was a place I remember my father talking of, though I believe he was talking about either coming up from the Success Pond Road or across the AT. Either way, I find myself drawn to places I remember him talking about, so rather than go the Kearsarge, which I don't think he ever mentioned, I ended up back at Goose Eye. I went looking for extreme conditions, and I found them. By extreme, I mean rain, thunder and lightning, and high temps. Though the temperature was only 70, the dew point was probably 70 and the humidity was 98%. (I know the temperature, I hike with a thermometer, but the dew point and humidity are purely anecdotal.) Let's just say it was muggy! And raining. The Maine Conservation Corps had worked on the trail during the previous week and the trail was it great shape. In spite of all the rain we had had, the trail was mostly well drained and firm. I hiked along the river to the crossing where Lucy and I had to turn back earlier this year. I hiked relatively slowly, because a) it was oppressively muggy, b) I needed to warm up and, c) I'm still not in trail shape. I crossed the "stream", expecting to start moving away from the sound of running water, which had been present to this point. Almost immediately, another "stream" appeared to my right. Boy, there is a lot of water up there. When I hike, I enjoy the full sensory experience. I love the smells of the woods; the sounds of the bugs, birds and water- even the sound of Lucy's collar jingling and the sound of my own footsteps and huffing and puffing. But in this case, the sound of running water was almost overpowering- it was all around me and really loud! I am a proponent of slow hiking, or maybe "off-speed hiking". There are certain places where hiking fast is great; it's excellent exercise and physically challenging. But, I've noticed that my awareness of the environment around me is inversely proportional to the speed at which I'm hiking. When I'm slow hiking, I really see the landscape. I notice things; both forest and trees alike (an allusion to "can't see the forest for the trees"). I've seen plants growing through a hole in a leaf from the previous autumn's leaf-fall; I've seen tiny ants hauling a queen ant up a tree trunk; I've seen boulder fields along a forest hill side, each with a tree growing over it like the wrapped tentacles of an octopus. When I hike fast, my focus goes to the rocks and roots of the trail, and where my feet are going to go. So, as I hiked slowly because of the conditions, my head was up; I was looking around. What a beautiful area! My primary goal was the campsite roughly 2.5 miles from the road. I am scouting places to "backpack" to. This is an ideal spot. There are two tent-sites around a common fireplace and rustic picnic table. The site is located where two streams come together, so the overnight sounds would be amazing. Looks very interesting indeed. I am planning to spend at least one night here this fall! The trail splits into a northern trail and a southern trail at the campsite. The "recommended" ascent route is up the southern trail. This takes you one of the peaks of Goose Eye, where it intersects with the AT (Appalachian Trail). From there, the proscribed route takes you west on the AT across a middle peak (the real peak) to another peak. Here you leave the AT and head down the northern trail. Sounds like an awesome route. Only thing is, the southern trail is closed do to hazardous conditions. So up the northern route I went. Immediately, the trail began a steep ascent. I was doing fine, but was a bit concerned, that my head felt hot to the touch. I felt fine, but my skin felt hot. Given the weather conditions and the potential for heat stroke or prostration or whatever, combined with my lack of conditioning (and the fact that this week would be a bad one to be limping around) I set a turn-back time of 2PM. One thing I have determined about solo hiking is that I feel compelled to pay really close attention to my body. And I always think about the trip down: a little tired up, leads to a dangerous trip down. Needless to say, I am sure I made the right decision. As I was nearing the end of the trail, I spotted a small beetle fighting its way through the forest debris covering the trail. What was interesting was that when I stopped to watch it, the beetle began, I guess, playing part of the debris. I watched it for a while and it didn't move. I moved downhill from it, and dang if it didn't out wait me. Interesting. Overall it was a great day. Wish I would have summited, but whatever, I got what I came for. I highly recommend this area.